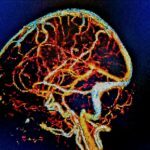 Patients in the intracranial arterial dissection group were more likely to show improvement in vessel stenosis than no change/aggravation. High-resolution magnetic resonance imaging (HR-MRI) may be a useful diagnostic tool for comparing outcomes among patients with nontraumatic intracranial arterial dissection (ICAD) and intracranial atherosclerosis stenosis (ICAS), according to results published in Neurology. In a prospective study conducted at a university medical center in Korea between January 2011 and December 2016, investigators sought to evaluate the outcomes among patients with ICAD and those with ICAS via use of HR-MRI. They compared functional outcome, recurrence, and changes in vascular status in patients with ICAD (dissection and no plaque on HR-MRI) and ICAS (presence of atherosclerosis plaque on HR-MRI). All patients were followed-up for 27.9 ± 19.3 months. Of the 312 patients enrolled in the study, 199 had ICAS and 113 had ICAD. The mean patient age was 59.0 ± 14.2 years, and 58.3% were men. The functional outcome, per measurement by modified Rankin Scale score, did not differ significantly between the 2 groups on day 90 after symptom onset, after adjustment for other factors (P =.095). Recurrent ischemic cerebrovascular disease on the relevant vascular territory was lower in the ICAD group (6.2%) than in the ICAS group (18.6%). ICAD was a significant independent determinant of disease recurrence (hazard ratio, 0.43; 95% CI, 0.19-0.98). Moreover, improvement in vascular stenosis on follow-up vascular studies was reported more often in those with ICAD (50.7%) than in those with ICAS (11.6%). ICAD was shown to be an independent predictor of vascular improvement (odds ratio, 7.94; 95% CI, 3.32-19.01; P <.001). Any stroke or transient ischemic attack was reported in 7.1% of patients in the ICAD group and in 20.1% of those in the ICAS group. Major adverse cardiovascular events were reported in 8.8% of those in the ICAD group and in 22.1% of patients in the ICAS group. The investigators concluded that “considering the high prevalence of ICAD in the patients with presumed ICAS, and the differential outcomes between the ICAD and ICAS, HR-MRI may be a useful diagnostic tool in this population.” The study findings suggest ICAD may well be a prevalent hidden cause of intracranial occlusive disease, which may thus affect the results of outcomes studies on ICAS. Shin J, Chung JW, Park MS, et al. Outcomes after ischemic stroke caused by intracranial atherosclerosis vs dissection. Neurology. 2018;91(19):e1751-e1759.